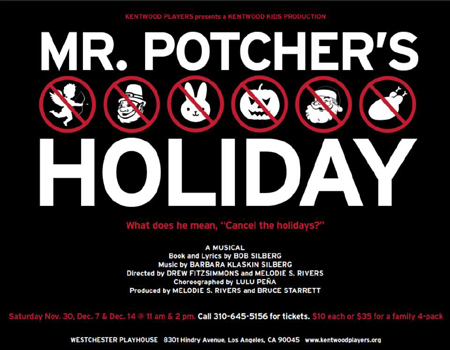 November 30 and December 7 & 14, 2013 at 11:00 a.m. and 2:00 p.m.
Mr. Potcher, a school consultant, eliminates all classes in the arts and all extracurricular activities. When a young student named Darcy tries to persuade him to reinstate these activities, he not only remains unconvinced, he decides also to do away with all the holidays -- actually eliminate them from existence. The iconic holiday characters (Santa, Easter Bunny, Cupid, Leprechaun, Jack-o-Lantern and Thanksgiving Turkey) conspire with Darcy to change Mr. Potcher’s mind. Darcy (Fiona Okida) researches artists and scholars. Shalena (Tyler Cable) makes plans for Potcher. Mr. Potcher finds his holiday. Cupid doesn't want to leave the island. Mr. Potcher falls in love. Zimmer, Darcy, and Shalena prepare to meet with Mr. Potcher. Mr. Potcher is acting crazy, thinking he can do away with all holidays! Shalena and Darcy prepare to meet with Mr. Potcher. Darcy's nightmare comes to life. What's happened to Mr. Potcher? Miss Teaford hopes Mr. Potcher will change his mind about eliminating all holidays.